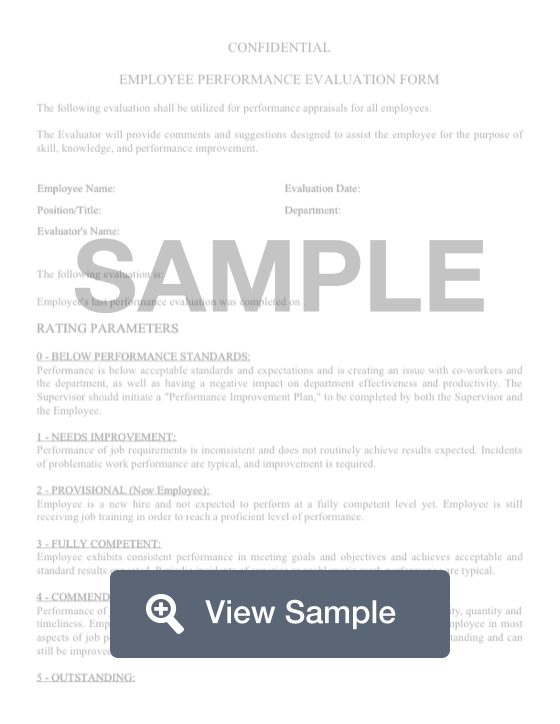 A Performance Evaluation Form is used by companies and businesses. A Performance Evaluation Form is used by companies and businesses. It allows them to evaluate employee's performance. This includes any employee from a salaried manager to an hourly maintenance worker. These forms may be used to help identify a struggling employee or to acknowledge an employee who is excelling. The form will list the information about the employee, and usually their supervisor as well. 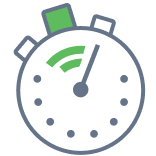 A Job Performance Evaluation Form will grade the employee on a variety of different attributes, such as punctuality or work ethic. These factors will be used to determine how well the employee is doing at their current job position. This information could affect the employee's current pay or it could help an employee get extra assistance with their job. Create a free Employee Evaluation Form in minutes with our professional document builder. When/why should you use an employee evaluation form? There is no set formula that indicates exactly what you should include in an employee evaluation form. Many of the things that you should include will be dependent on the employee’s role within your organization. You will be able to find sample employee performance review templates online. The best employee evaluation forms consolidate of the the key information into one concise document. The most important parts of the employee’s role should be included on the form. There should be an easy-to-understand rating system and room for the manager to write in more elaborate feedback. As you are considering what items to include on an evaluation form template, look to the employee’s job description. Easy to use - Make sure the manager understands how to complete the form and the employee understands how to read it. It should provide a simple way for executives to make decisions about hiring, firing, and training. Focused - The form should include questions that are designed to help your organization achieve its primary goal in conducting employee performance reviews. For example, are you trying to identify the most promising employees? Are you trying to learn about the areas where employees need the most development? Clear - The ranking scale should be as consistent and fair as possible. Make sure that the employees and managers know how your rating scale works. Who should fill it out? The evaluation form should be filled out by whoever will be conducting the employee’s evaluation. This helps to prevent misinterpretation and confusion and gives the employee the opportunity to ask questions to understand why they received a specific rating. In some organizations, the person who fills out the evaluation form will be a human resources manager. In other companies, the employee’s direct supervisor or department head will fill out the form. Should I share employee evaluation forms with the employee? You can choose to not share evaluations, share only specific parts of evaluations, or share full copies of the form. One thing to keep in mind is that if you give employees copies of their forms, they may share those forms with their co-workers. Do not share forms that include information that you’d like to be kept confidential, such as salary information.